With the release of Version 2, the Sincpac C3D gains a framework of Dynamic Links that fills many of the gaps in the dynamic functionality of Civil-3D. With this release, we now have features that should have been built-in to Civil-3D years ago! And best of all for some users out there, these Dynamic Links are fully-functional (with one exception) in all versions of Civil-3D (2008 and up)! The only exception is that User Defined Properties (UDPs) cannot be used in the 2008 version, so Dynamic Link features that use UDPs are disabled in the 2008 version. Dynamic Links may only be created and edited using the Power Module of the Sincpac C3D. However, once created, the links will be updated on computers that are running only the Reporting, Drafting, or Points Modules. So if you have the Power Module (or the Full Edition, which contains all three modules), you can create Dynamic Links. Then your coworker, who might have only the Drafting Module, will be able to edit the drawings, and see the Dynamic Links update. However, your coworker will not be able to create new Dynamic Links, or edit the existing links. Cogo Points may now be linked to a variety of objects, including Surfaces, Profiles, Alignments, and linear objects such as Feature Lines, Survey Figures, 3D-Polylines, or Lines, using the new DLPoints command. Once linked, the elevation of the Cogo Point will dynamically change along with that of the master object. Or, use the "Lock" feature to lock the horizontal location of the Cogo Point to the Alignment or Profile. For example, lock a Cogo Point to the beginning of a curve in your Alignment, and if you move the Alignment, the Cogo Point will follow. All updates are dynamic, and occur instantaneously as soon edits are made to any portion of the model. In addition, you may configure the Dynamic Link so that the Raw Description of the Cogo Point is dynamically updated with a Station and Offset, as taken from an Alignment. These points may then be used in Point Tables, for a dynamic Station/Offset table, among other things. And be sure to check out the video demonstration of the Point Links, as well as the video demonstrations of how to create a dynamic Station/Offset table and how to create a dynamic Cut/Fill table. 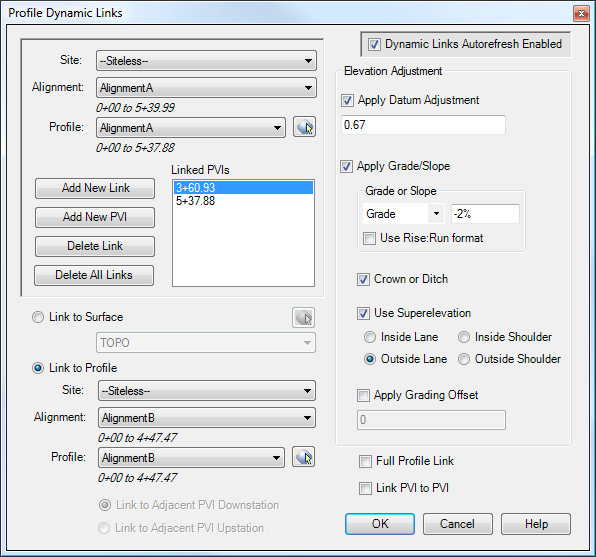 Individual PVIs in Profiles may now also be linked other objects, including Surfaces, other Profiles, or adjacent PVIs in the same Profile, using the new DLProfiles command. Link the centerline Profile for a side road to the Profile of the main line, and the side road will automatically adjust to match the main line. 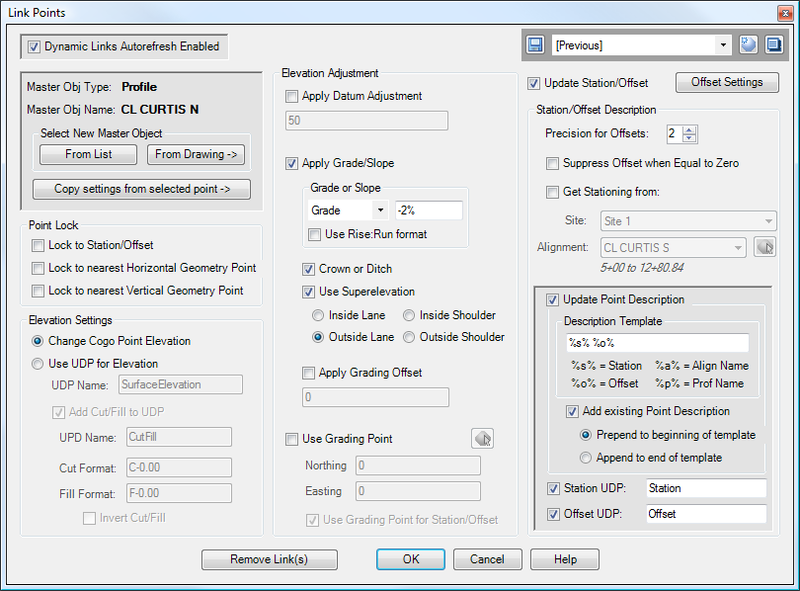 Or link your Left and Right Flowline Profiles to the Centerline of Road Profile, and watch the flowline profiles change automatically with any change to the centerline. There are also two video demonstrations of the Dynamic Profile links. The first one is an introduction to the Profile-to-Profile linking functionality, and the second illustrates both the Profile-to-Profile and Profile-to-Surface linking capabilities in more of a real-world design scenario.